Who knew that Baking Soda was such a great cleansing ingredient/exfoliator? Not me. My favorite part about using these products was the fun fizzing noise that the baking soda products make as you cleanse your face! The Bioré Baking Soda Cleansing Scrub starts out in a powder form and turns into bubbles as you cleanse your face. It not only strips your pores of dirt and oil, but also gently exfoliates. After repeated use of these two products for a couple of days, my combination type skin was already feeling fresher & smoother without feeling dried out. 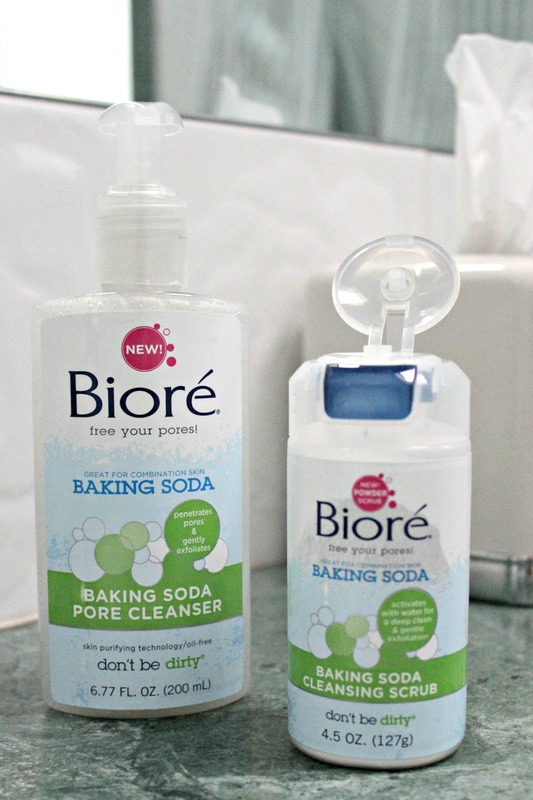 Get your Bioré Baking Soda Cleansing Scrub & Bioré Baking Soda Pore Cleanser at your nearest Target. This post is done in partnership with Bioré . All thoughts/opinions are my own. I have uberly sensitive skin but I used Biore' back in the day. I think i'd love this! I love it when my face feels clean. I do as well! Biore products are really gentle on my skin! It fizzes, how cool! Need to pick some of this up! That baking soda is crazy! I've always heard it is a good cleaner, but I have never tried it on my face. I had no idea baking soda was good for your face until now! New product reviews! I always love that! Must try this one...fab review! Me too! I get nervous to try out a product but love hearing that other people enjoy it! I love the fizz! I've definitely been trying to take better care of my face and might just need to try this! Me too! Creating and sticking with a routine can be tough, but these products are simple to use! These sound great. I have always been intrigued to try baking soda to exfoliate my face and now you convinced me. Hope you had a great Valentine weekend! It was such a cool product! Different than anything I've used before!